Peru's President Pedro Kuczynski waves as he welcomes Russia's President Vladimir Putin to the opening session of the annual Asia Pacific Economic Cooperation, APEC, summit in Lima, Peru, Nov. 20, 2016. Russia is a country of incredible courage, Peruvian President Pedro Pablo Kuczynski said in an exclusive interview with TASS First Director General Mikhail Gusman. "I would like to tell the Russians that I admire them because the Russian people is incredibly strong," he said, adding that his words could be illustrated by the history of World War Two, when the Soviet people rebuffed the enemy despite numerous casualties. "The victory in World War Two would have been impossible but for the resistance of the people of the Soviet Union," the Peruvian leader said. "I think Russia is a country of incredible courage. Despite all of its suffering and tears. This country should be proud of its victory." 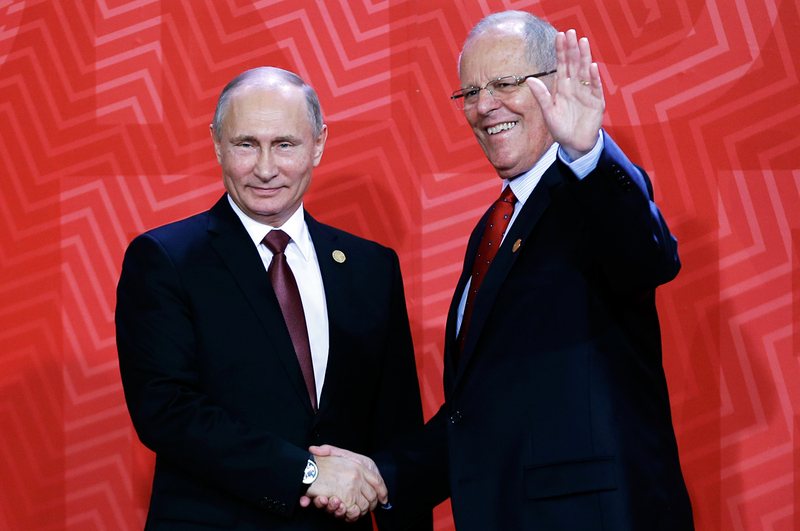 Peru, according to Kuczynski, is interested in the development of bilateral relations with Russia. Among the most promising areas of cooperation, in his words, is trade in farming products.